The need to be forgiving… @codepo8 ▪ Anyone is allowed to write code for the web – or use whatever they want to create that code. ▪ Users shouldn’t suffer from developer errors; user agents need to be forgiving (RIP XHTML). ▪ What you put on the web will not be consumed the way you intended it to – your products need to be flexible. World Wide Mess @codepo8 ▪ This freedom meant people took liberties… ▪ As things “just work”, we spent years adding suboptimal products to the web. ▪ These legacy products are likely to never get fixed – maintenance is boring. ▪ Browsers are big and slow because they need to show the web of yesterday, today and tomorrow. So why don’t we build great solutions? @codepo8 ▪ Resources with upvoting options favour the how over the why ▪ We’re not paid to learn, we’re paid to deliver ▪ Peer pressure makes developers who don’t know things afraid to admit it ▪ There’s always a “good enough” way to create a lot in a short amount of time. 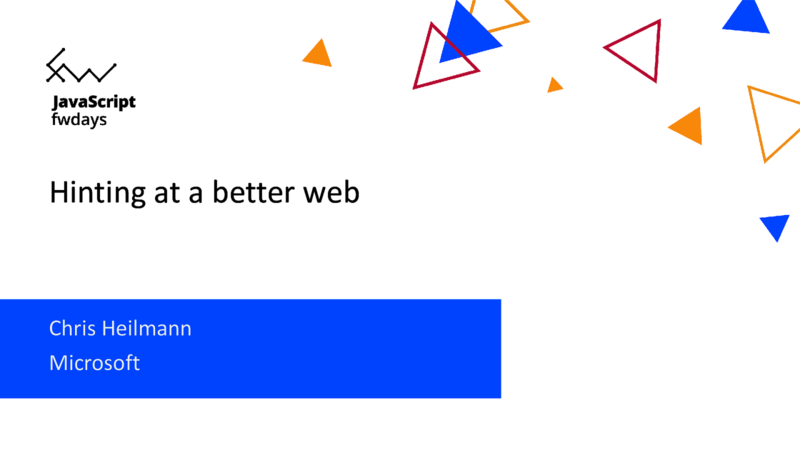 The web is not in a good state and that doesn’t make any sense. We have better tooling than ever, we have predictable outcome of our code in browsers and knowledge is available for free. So why is the average website huge, slow and full of bugs? One reason might be that we’re arguing about the wrong things and try to solve everything ourselves. In this talk we’ll look at some of the great things we can use to automate some of our work and have a development environment that teaches us best practices while we do our work, not when we get the time to look them up.